Lima Central Catholic’s Biggz Johnson goes up for a shot against Liberty-Benton’s Cole Busch, left, and Keaton Rath during Saturday night’s game at Msgr. Edward C. Herr Gymnasium. 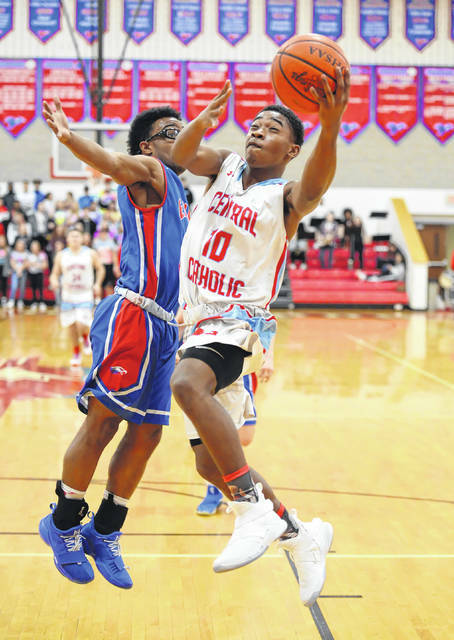 Lima Central Catholic’s Jeremy Allen Jr. puts up a shot against Liberty-Benton’s Mehkei Jenkins during Saturday night’s game at Msgr. Edward C. Herr Gymnasium. 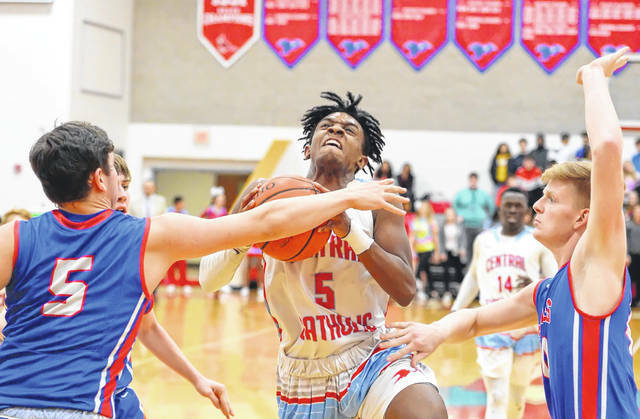 Lima Central Catholic’s Biggz Johnson drives against Liberty-Benton’s Mehkei Jenkins during Saturday night’s game at Msgr. Edward C. Herr Gymnasium. LIMA – The last time Lima Central Catholic hit the courts for a game was Jan. 24. But the Thunderbirds showed no signs of rust against Liberty-Benton Friday night. 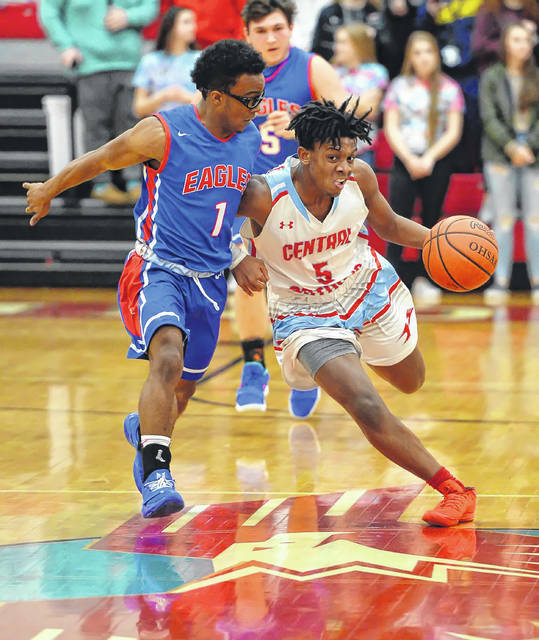 In fact it was just the opposite as Lima Central Catholic jumped on the Eagles early to notch a 64-35 win in the non league affair. With the win LCC improves to 10-8 on the season. Liberty-Benton falls to 5-13. It was the LCC defense that allowed the Thunderbirds to break out to a 12-3 lead after the first period and own a 33-12 advantage at halftime. In the pivotal first two stanzas, the Thunderbirds’ defense smothered Liberty-Benton and forced a number of turnovers that were converted into baskets. LCC held Liberty-Benton to its lowest offensive output of the season. LCC head coach Frank Kill said having so many days off enabled the Thunderbirds to put in practice and additional preparation for this game. But Kill said it came down to the Thunderbirds’ defensive effort. Liberty-Benton head coach Ben Gerken said the Thunderbirds defense helped dictate a more uptempo approach and that is not the the Eagles’ strong point. Gerken added that LCC did a good job of playing the halfcourt offense when they had to and despite throwing up a zone defense, the Thunderbirds effectively worked their way in for buckets. “We went zone and take our chances with their athleticism going to the rim and again they are well coached and got some good looks inside against our zone,” Gerken said. Lima Central Catholic took command of the game in the second quarter. At the onset of the period, the Eagles scored the first five points and sliced the lead to 12-8 with 6:15 remaining in the half. But that would be as close as the Eagles would get as the Thunderbirds answered with a 18-2 run to break open a close game and produce a 21-point cushion going into the second half. Kill added that the defenses primary focus was stopping Ben Spiess and in the first half that is exactly what happened as they limited him to four first half points. Spiess, who ended up with 20 points, showed how hot he can heat up after putting up 16 I the final two quarters. Controlling the boards was also a major factor in the Thunderbirds win. LCC outrebounded Liberty-Benton 39-25. Offensively, Kill said this was the most unselfish game the team has played all season. LCC’s Shawn Thomas led a quartet of T-Birds who scored in double-digits with 13. Jeremy Allen and Tre Garner, who snared eight rebounds, scored 11 each and Rossy Moore added 10 points.